Who ever said, “having kids is like having your heart walk outside your body” was profoundly correct. Having children is an incredible journey like no other. However, no one readily warns expecting parents of the amount of STUFF that children need and often acquire. I’ll be honest. I dread birthdays and gift giving holidays because it means that my boys are going to get more toys- and the last thing they need are more toys! Of course, they love it. I want them to enjoy new stuff, but when you are short on space, toys become a a daily burden. To help ease this burden, I am going to share with you a few of my favorite organizing items for kid’s stuff. 1)Boon Animal Stuffed Storage OR Bean Bag covers to hold stuffed animals. Amazon carries these clever bags, and they are reasonably price. Another alternative is to purchase a bean bag cover and put stuffed animals inside. Storage and seating in one! 2) Swoop Bags– for small toys. If you’re like me you have a love/hate relationship with Lego’s. They are great for a child’s development, but they really hurt when you step on one! Swoop bags can help corral any small toy including Lego’s. 3) Over the Door Shoe Organizers (Clear pockets). Over the door shoe organizers are one of my all time favorite organizing tools. These organizers are great for many different items and spaces. In a kid’s room, they can hold small toys or can be used to hold small craft items. My suggestion is that if you have a closed closet door- then it should have one these organizers on it. 4) Open storage containers or totes. In a past post- Too Big, Too Small- A solution to children’s clothing– I shared how I manage my kid’s ever changing clothing sizes. Having an immediate place to corral items that are either too big or too small helps to manage their clothing. I also use basic fabric totes to hold their toys. Toy libraries are a great way to manage a large amount of toys. 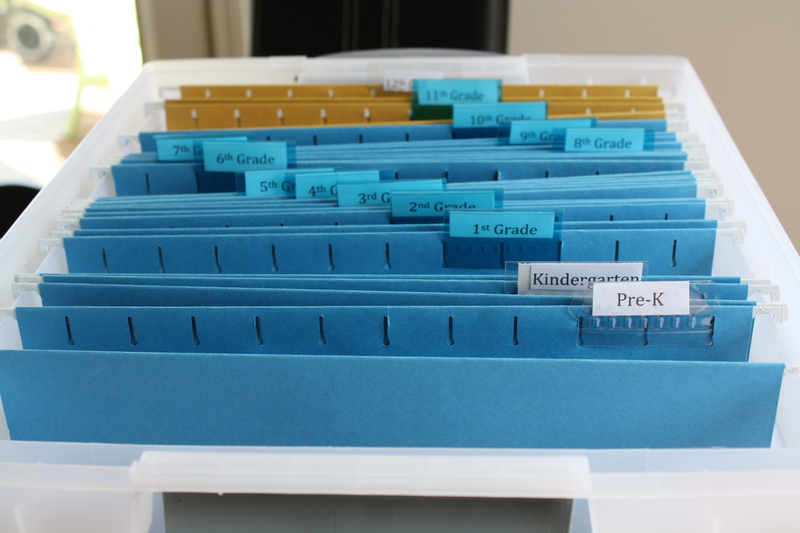 Use a file box to hold all your child’s paper “mementos”. Follow this link for instructions on how to create such a box. 7) Use Artkive and toss all (or close to all) of your child’s school clutter! Artkive is an app for your smartphone that allows you to take pictures of your kid’s art, papers, tests, or crafts and then compiles them into a hard backed book when you are ready. So simple and easy to use! These are a few of my favorite things for kid’s stuff! What’s your favorite way to manage their clutter?